When defensive lineman David Carter set out to gain weight for football season, he added milkshakes and entire gallons of milk into his daily routine. And the weight came, but so did the pain, tendonitis, fatigue, and numbness. It wasn’t until he watched a documentary about the health impact of animal products that David realized he was feeding his body’s diseases. So this barbecue-loving, dairy-chugging, NFL defensive lineman did the unthinkable: he went vegan. And everything changed. 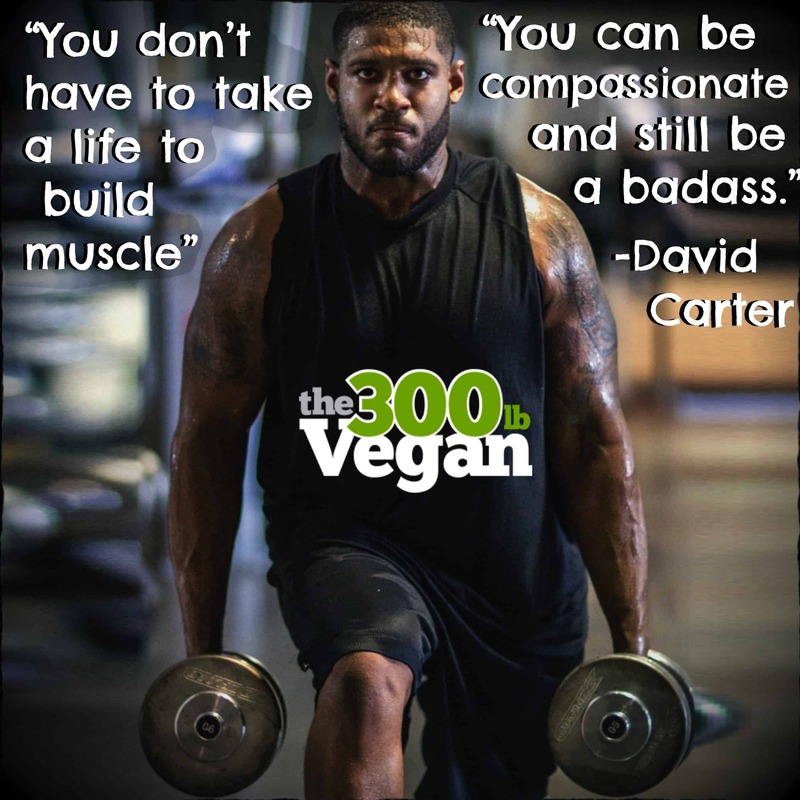 Having played for the Arizona Cardinals, Dallas Cowboys, Oakland Raiders, Jacksonville Jaguars, and Chicago Bears, David Carter was firmly entrenched in the football world of consuming tons of animal products to maintain his size. But it came a great cost to his health. I’m honored to have him on the channel as part of the vegan athlete series. Without further ado, let’s hear from David himself. And be sure to stay to the end of his interview when he starts dropping some serious truth bombs. “Before going vegan, I was just like everybody else and I thought that meat was the only source of protein, I had to drink as much milk as possible for stronger bones and get my protein [and] calcium. I was like that because of my family. I grew up, spent my summers on a farm, my family owned a bar-b-que restaurant, so it was definitely ingrained in me growing up that meat was the way to go, meat was the only way to get strong. As a matter of fact my mom … had a deep freezer and every year she would just fill that deep freezer up with steaks and chicken and stuff. And now that I look back at it, I’m like, damn, how many cows – I know I ate more cows than anybody else. “It was really after I got released from the Arizona Cardinals. My wife and I, we were just talking and she was like, “let’s watch this documentary Forks Over Knives. And at that time I got released as I was dealing with a lot of injuries that I had: tendonitis, early onset arthritis, I had nerve damage in [my] hand. I couldn’t feel three [of my] fingers. I couldn’t grab a plate. I couldn’t do bench press because my joints were so filled with pain. I could only do a little bit of weight, 315, which is only a little bit for me. They were giving me high blood pressure medication at 25 years-old, younger than that, actually. You know, all that stuff added up and these are all old-man diseases or old-man illnesses that I was dealing with. “So, to be honest, I didn’t start out as an ethical vegan at all. I had leather everything, leather seats in my car, all that stuff. But, what happened to me, was that once I started seeing the benefits of the vegan diet, and I was like, “I really don’t need to eat meat to gain protein” and that made me think “why the hell are we killing these animals for? We don’t need to eat them, we don’t need leather. What’s the purpose of these things?” And that’s where the ethical part came. And I told you I have a Great Dane, that’s my furry child, that’s my son, and it’s like, if that were happening to him that would really hurt me because that’s my family. And he has a nervous system, central nervous system, he has a brain, he expresses emotion, he’s smart, he understands, he knows what’s going on, and you know, he loves just like I love. And my wife has those same feelings. If that were to happen to my wife, like you know, that would just drive me crazy, and that is what got me. And they don’t want to go through this anymore than me. I hope you enjoyed hearing David’s conversion story. He’s had quite a journey and is now an animal activist and vegan educator, going into schools and sharing his story and the healing power of plants, as well as the ethical importance of a vegan lifestyle. You can connect with David on social media via the links below. He’s just recently launched his brand new YouTube channel, so be sure to head over and subscribe to get him started. Now I’d love to hear what you thought about David’s story. 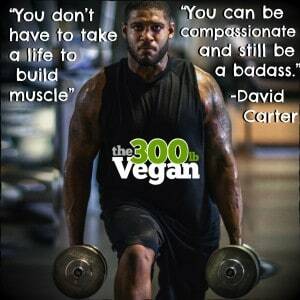 Are you an athlete interested in going vegan but unsure if you can sustain your strength? Did you already go vegan and has it affected your performance? Let me know in the comments. If you enjoyed this video, give it a big thumbs up and share it around to show what’s possible on plants. If you’re new here, do hit that big red subscribe button down there for more awesome vegan content every Monday, Wednesday, and some Fridays and to not miss out the on the rest of the Vegan Athlete series. To help support Bite Size Vegan’s educational efforts, please see the support links below or click on the Nugget Army icon or the link in the sidebar. Now go live vegan, bust some myths, and I’ll see you soon. David Carter is awesome. He is also a kind and compassionate person and very intelligent. David Carter is a wonderful teacher. The world is better for having David Carter. That sounds somewhat racist. Most animal abuse videos I have seen are usually of white men (shame on my race) beating and murdering the animals with the exception of some hispanic looking as well. Color DOES NOT matter, cruelty does! Saying that isn’t a way to get people of color to come to veganism. David couldn’t be more right in saying that all social justice causes are the same. We vegans accept all sizes, shapes and colors regardless of species. Bottom line. If he or any other vegan of color opened up an animal sanctuary and had paid employees I would apply in a heartbeat, because not many existing sanctuaries have job openings.